Why pop filters are necessary for recording! A pop filter is a necessary tool for clear vocal recordings. They help to get rid plosives like Ps and Bs and can cut down on sibilance which is "s" sounds that can be annoying during playback of your recording. Most pop filters have a nylon/mesh material. Some now have a light steel mesh that actually work better. Our breath is powerful when speaking or singing so this tool helps break it up to get a clearer recording. I think you are really great. I have read through your articles and posts. they are great and it gives me a sense of thoughts. 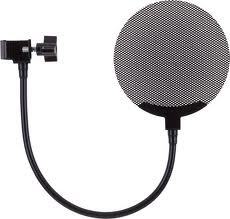 A pop filter or pop shield is an anti-pop protection against noise for microphones, typically used in a recording studio. It is used to reduce cracking and ringing in the recorded speech and singing. A good sound track can make or break your recording. The quality of your audio is often the make-or-break aspect of your recording.